Childages 4-10 yrs. Children 3 and under are free. Experience the awe-inspiring sight as the sun sets below the horizon of the southernmost point in the United States. This colorful spectacle is the backdrop for your dining and dancing pleasure as you cruise historic Key West Harbor aboard the state-of-the-art Gold Coast Yacht. Highlights of the two-hour evening excursion include a lavish tropical buffet, unlimited adult beverages and a live DJ playing a variety of hits. The 65-foot vessel features two full bars, full-size restrooms, an air-conditioned cabin and open-air sundeck as well as an illuminated main deck, underwater lights and some of the best seats for watching one of Key West's famous sunsets. Avoid the crowds as you sail past several of Key West's iconic landmarks, such as the popular Mallory Square Sunset Celebration, while you dine and dance on the Key West Dinner Cruise. The two-hour festival on the water provides an excellent vantage point from which to watch one of the city's legendary sunsets. Each evening two hours before sunset, the docks closest to Mallory Square host the Sunset Celebration, a multicultural event that attracts people to the water's edge of the Gulf of Mexico. This famous daily festival draws a variety of street performers, food vendors, arts and crafts exhibitors and thousands of tourists from around the world. The 65-foot Gold Coast Yacht separates you from the crowds and provides some of the best seats from which to experience breathtaking unobstructed views of a world-famous Key West sunset. 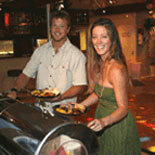 In addition to the roomy upper deck, passengers enjoy a tropical buffet of Caribbean Roast Pork, Black Beans and Rice, Deep Fried Sweet Plantains, Grilled Marinated Chicken , Marinated in Pineapple & Soy Sauce, Fried Fish with Lemon and Tarter, Shrimp Pasta Salad, Mixed Veggies, Mashed Potatoes and Cuban Bread and Butter. 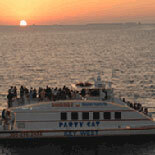 The evening also includes unlimited frozen and mixed drinks, champagne, wine and beer as well as water and soft drinks. After dinner, guests are invited to step out onto the lighted dance floor in the air-conditioned cabin and enjoy the Island Sounds of DJ Maestro. Create a memorable event for your time in the Conch Republic by making reservations now to get your eTickets for the next Key West Dinner Cruise. William St and Lazy Day Ln. One block from 201 William St. Take Caroline to Margaret St, enter parking lot and park at end which is William Street. Head for the water. Child Ticket: 4-10 yrs. Children 3 and under are free. 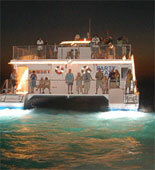 Reservations are required at least 2 days in advance of desired cruise. Wear soft soled shoes only.